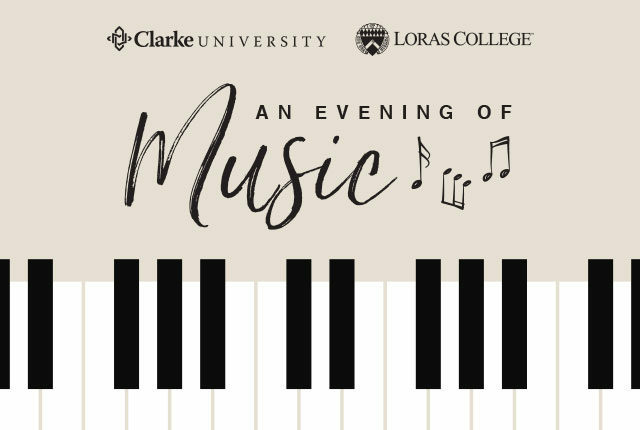 Clarke University and Loras College will come together for a musical performance on the evenings of Friday, April 27, and Saturday, April 28, at 7:30 p.m. in Jansen Music Hall on the campus of Clarke University. The performance is free and open to the public. Donations to the Clarke and Loras music and musical theatre departments are graciously accepted. The event will showcase students performing in multiple genres, portraying numerous characters, and exploring what it means to be a 21st century vocalist. Music selections range from operatic favorites such as Mozart and Strauss to today’s contemporary musical theatre composers. Selections include Die Fledermaus, Marriage of Figaro, Fiddler on the Roof, My Fair Lady, Finding Neverland, Sister Act, and much more. This event is directed by CJ Greer, Assistant Professor of Music at Clarke University. Musical direction is provided by Dr. Adam Kluck, Director of Choral Activities at Loras College. Special thanks go to Frank McClain, Craig Allen, and Daniel O’Dea for additional direction. Clarke students featured in the performance include Lauren Kramer, Mason Jaeger, Lillian Garcia, Jackie Moss, Grace Pawlowski, Cat Sears, and Kayla Winandy. Loras students featured in the performance include Ben Pashon, Theresa Milazzo, Erica Timmerman, Cheyenne Secor, Simone Guio, Rachel Heiderscheit, Danielle Besler, and Ben Colwell. This production was collaboratively conceived in mutual agreement between the institutions and music faculty. Faculty say this is the first of many collaborative productions between the two schools. For additional information, please contact Clarke’s Music Department at (563) 588-6575.